I have a few experiences in Madagascar that I would like to share with you. Bear with me because as I think of them I get somewhat excited and start foaming at the mouth. I cant wait to get back there again. 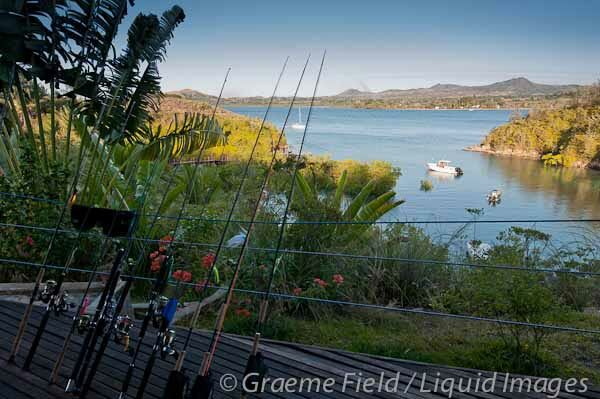 Besides for the beauty and tranquility there I was interested in the fishing part most of all. I set out with a couple of goals to achieve ( always risky as one can easily get disappointed ) and managed to achieve both of them. 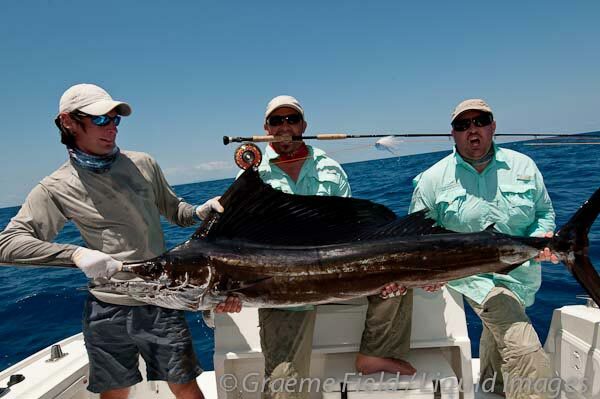 One was to catch a sailfish on fly. Well imagine my surprise when we went to sea and started to see sailfish fins popping up everywhere. I could not believe it either. Free swimming sailfish?? Amazing sight that does not get old and that I will never forget. To see that sailfish all coloured up billing baitfish then gently easing around and sucking them in was amazing. 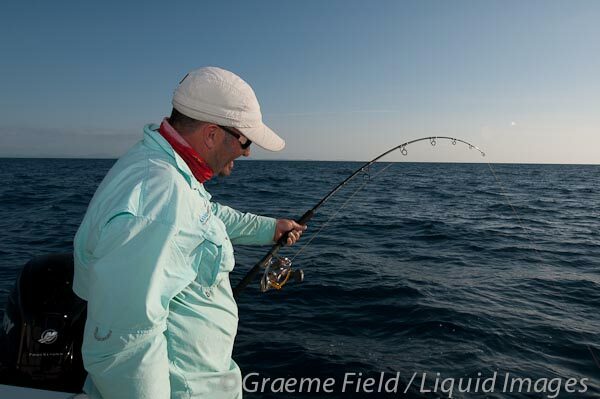 We were moving between reefs where we were jigging and so had left a stick bait out incase there was a GT in the area and a sailfish came up and smacked it. We stopped put out teasers and started to troll. I was up on the fly rod and I was pumped to take my chance if and when it came. Oh boy did it all happen so quickly. I was focused on the teasers moving through the clean warm water and suddenly i saw a bill hitting one of them . sailfish right teaser I shouted. Then there were more. Maybe 6 sailfish in all getting real excited about tasting these strip baits. The guys all jumped in and started bringing in the teasers slowly. I started to false cast , the last teaser came out, I presented the fly and it turned and slurped in the fly. I felt the tightness and gave it 2 good hard strikes and the rest they say is history. 20 minutes later I had achieved my goal of catching a sailfish on fly. The crew were great. Cool calm and collected which really helped me. A few snap shots and we let her go. Awesome, awesome awesome. What a feeling. The next experience I would like to share is the trip to the much heard about castor banks. A 2 hour travel from the lodge was not an issue as we cruised at 20 knots and were super excited to get there so the trip felt like half an hour. 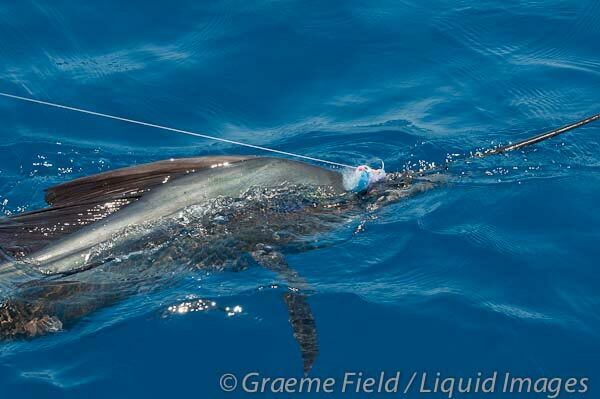 We flew past a couple of marlin on the way ( true story ) and from a depth of a 1000 meters it started to come up to 30 to 40 meters fairly quickly. 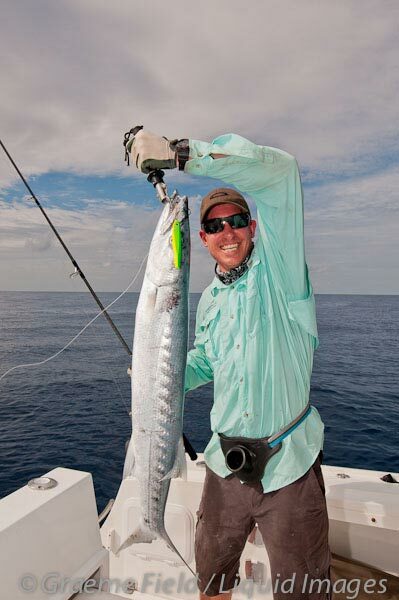 Here we got a few big barracuda just trolling small lures. We found a nice ledge and dropped down the vertical jigs. Well 3 of us went down and 3 of us had 4 or 5 pulls off the bottom and yes all 3 of us were in. 3 different species were pulled up and I landed a roughly 15kg GT. 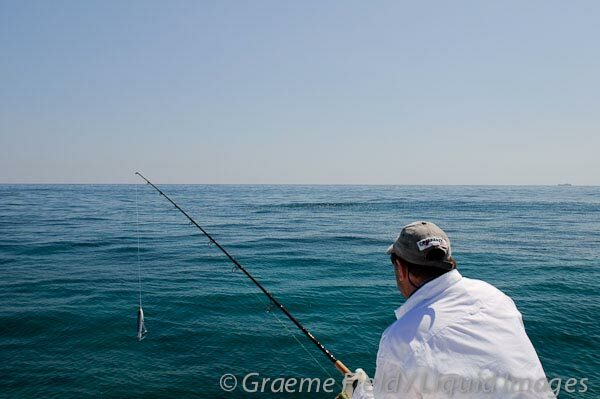 Next down I pulled up a 7kg bluefin and then fought a dog tooth for a while until it bit me off. Half an hour of chaos and I was knackered. I had to take 5 minutes to re gather and reload before we got going again. 1 guy would hook a fish and move to the back. Then the next and then the next. It was a procession and the most unbelievable experience. Lastly I must talk about the dog tooth tuna. What a beast. We were pulling teasers along a nice drop off for sailies when we decided to cross over a reef to a section of deeper water on the other side. Next thing the teasers were getting pinged all over the place. We all thought bonnies and so brought the teasers in so as to keep the strip baits from being destroyed. Well the bonnies turned out to be doggies and they looked ready for a scrap. 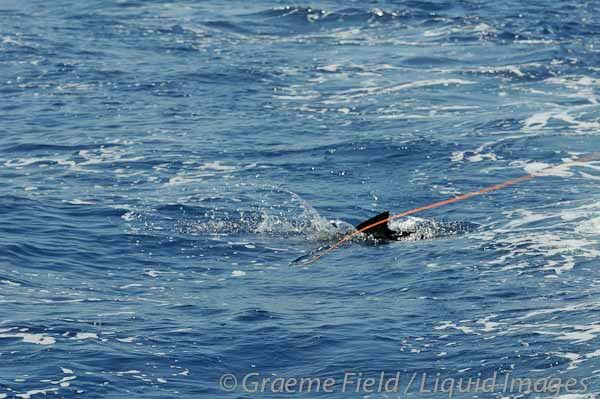 We duly obliged by marking the area swinging around and dropping some buck tails and verticals down in 25 meters of water. Game on. I was using a medium stick and felt a bit uneasy as I knew of these warriors reputations. Twitch twitch bang Johnny on. For the first 5 or so seconds it felt like a warm up fish like maybe a rosy job fish but then the gears started to change at a rate of knots. With the rod bending and the reel screaming I just thought does this get any better. This is what I was here for. 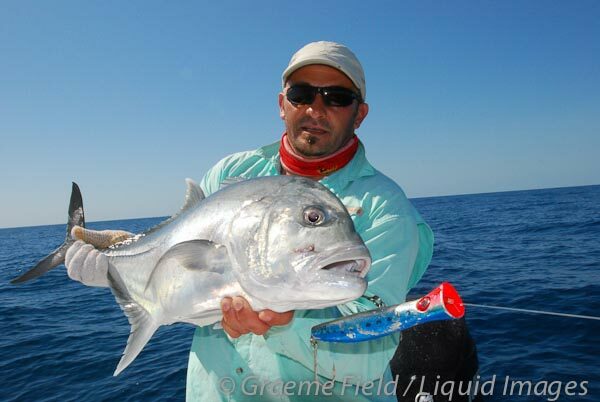 A few turns of braid were left on the reel when I managed to turn the fish and landed a 15kg specimen. Not the big 60 or 70kg the guys talk about but you know I was content. That was fun. Our 1 skipper jumped off the back of the boat with a pair of goggles and could see a bunch of doggies lurking like a bunch of thugs on a street corner. I switched to a heavier outfit and managed 3 more before we had to get back to the lodge. Between the doggies we also managed a couple of job fish and grouper. Madagascar was truly a wonderful experience and I can recommend it to everyone. Like anywhere you have your slow periods but when you get on to fish beware. Its like a dog show. 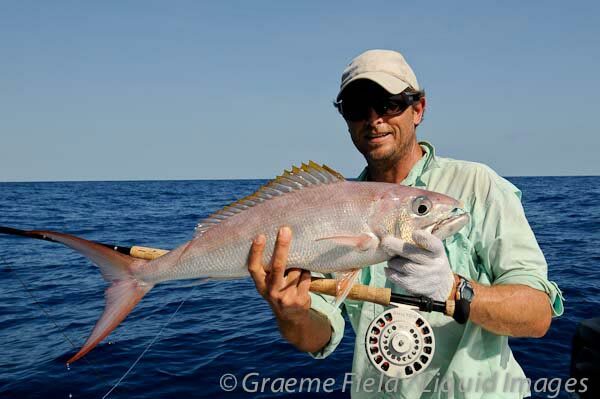 My fishing highlights on the September trip to Madagascar have to be the first and last fish I caught on the trip. Out on “King Julien” on the first afternoon, I was throwing a stick bait off the main drop-off when a Sailfish, my first, attacked my lure about two meters from the boat. Jumping immediately and peeling off line it leapt and somersaulted, twisting wildly in the air. It was absolutely breathtaking. After a very cautious forty minute fight, Brandon helped lift it out of the water for a quick photograph, before I had the pleasure of releasing this beautiful fish back to it's azure blue heaven. That set the tone for an amazing 10 days fishing, ending on Castor Banks where on the last deep jig of the day I landed my first decent sized Doggie. This incredible fish stripped me to the knot twice eliciting a constant scream of passion and pain from my dry throat. I was barely able to lift it for the photographer before we slipped it back into the ocean. It was the perfect to end a marvelous fishing trip. I promptly fell asleep and slept all the way back to the lodge. The size of fish (and my smile) lives on in my memory.